TraceParts has a long association with DS SolidWorks being their main content supplier for their portal 3D ContentCentral. Since 2007, DS SolidWorks has been a regular user of TraceParts’ e-marketing services. 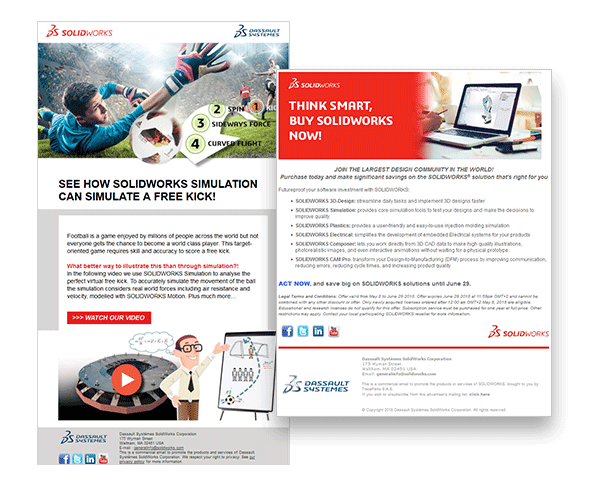 SOLIDWORKS keeps the international CAD community informed about its new products through TraceParts banner advertising, in the e-newsletter, and especially with e-mail campaigns to the user base. Often the e-blasts are sent out to tens of thousands of French, Belgian, Spanish and Dutch designers and engineers, all in their native language. “From the results of the campaigns we and my American counterparts at DS SolidWorks run with TraceParts, we know that TraceParts users are a dynamic community on the lookout for innovation,” said Antony Hervo.